I’ve been very busy recently. My copywriting business has suddenly become busy again – always good for the bank balance – and I’ve been ploughing on with the Kaffe knitting as well as designing a new quilt and putting it together. What’s more the postie’s been busy too. Yesterday he brought the last part of my Hancock’s order – three lovely Kaffe threads, gorgeous colours, and a lovely Kaffe shirt stripe. Those threads look too lovely to use. Then the postie came today with a Snoopy Postal Bag (I’ve never seen one of those before! 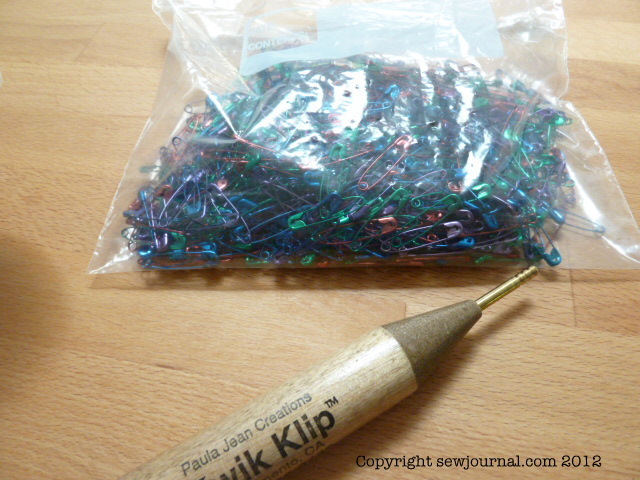 ), and inside were thousands of tiny quilt pins and this fantastic doodah for closing them. Thank you Sylvia! My dear friend traipsed half of NY state looking for these for me and I’m very grateful. 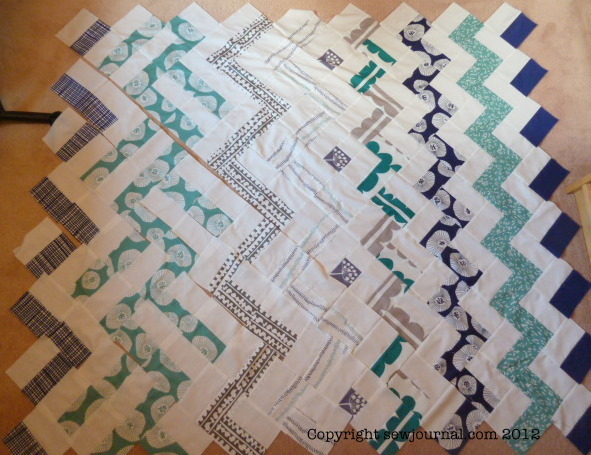 Here’s a photo of my half completed new quilt design. I’m planning on machine quilting and then embellishing with Sulky Blendables large stitch hand quilting afterwards. Mr Tiggy “helped” me lay it all out but in the end the room wasn’t big enough for both the quilt and Tiggy so one of them had to go! 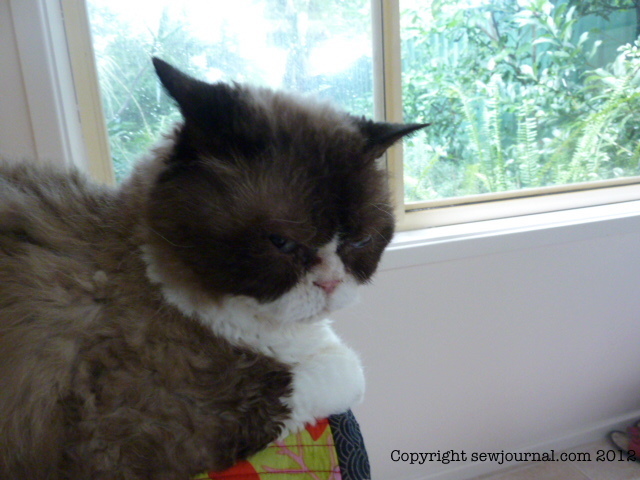 He wasn’t happy at being evicted from the sewing room as you can see. Ooooh, lots of goodies today! You’re right about that thread, it’s gorgeous. The quilt is coming right along. Are you going to leave the edges like that, or even them up? I like them as-is, just in case you were wondering……lol. Oh, you were really in the dog house with Mr. Tiggy, weren’t you?! Let us know how those Kaffe threads are to work with. The colors are luscious! The Snoopy postal bags have just come out. Aren’t they fun? You will love the “doo-dah” for help with fastening the pins! I love mine. Your quilt is lovely. Hopefully Mr. Tiggy has forgiven you. 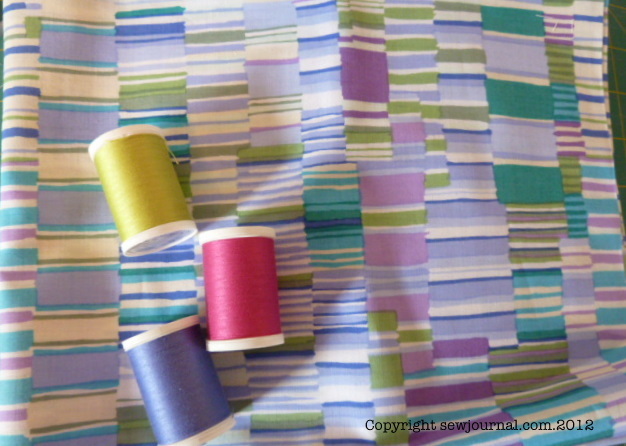 Love your quilt Munaiba, a seriously clever way of progressing shapes and colours. I don’t think I’ve ever seen a cat give such a look before. Will admit to having been on the brunt end of a few of those sorts of looks from a friends cat, but never this expressive.